MIUI-Style Launcher Now Available For All Android Devices, Download Now! Itching for some MIUI action on your phone? Well, chances are you’ve already rooted your smartphone and have flashed the popular MIUI custom ROM. If, however, you can’t or won’t flash said custom ROM, you can always give one major part of it a try with this newly released MIUI-style launcher which works on all Android devices. The launcher comes from the folks over at XDA Developers. User Quinny899 took a Chinese version of the MIUI-style launcher called Tencent Desktop and translated it to English using Android Translator by UziTech. MIUI Launcher looks and works a lot like the original: there is no app drawer; the apps are strewn across the many homescreens available in an iOS-like fashion, there are custom icons, support for themes as well as the ability to store multiple apps inside folders. 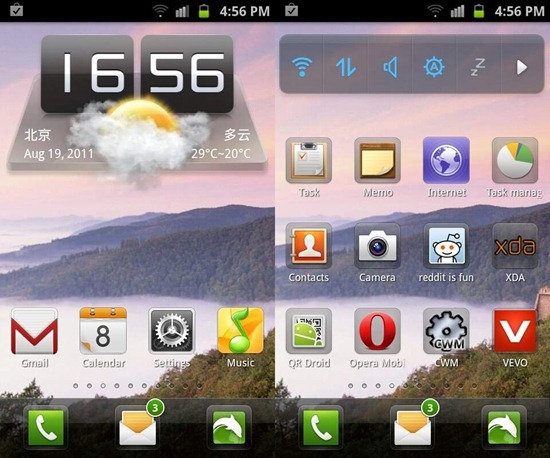 Tencent Desktop is a translation of the Chinese Dev’s MIUI Style Launcher. it doesn’t have an app drawer, has some MIUI icons, supports themes and has iPhone/MIUI lookalike folders. It runs very smoothly on slow phones (such as my LG GT540) and has a dockbar with up to 4 icon support. Apps such as Gmail, Maps, Search etc. have their own custom MIUI-like icons while the rest of the icons get to have a transparent background. It’s not exactly like the original MIUI ROM, but it is quite close. We’ve personally tested the launcher on our Samsung Galaxy S II unit and can confirm that it works as advertised. Installing the launcher is easy. Go to Settings > Applications and check the Unknown sources box in order to sideload non-Market apps. Then go ahead and download the .apk file to your Android smartphone from the link given at the end and install it. This does not require a rooted phone. We recommend going for Vipitus’ download as it packs updated icons.